Editor’s Note: In this edition of From The Archives, we re-visit one of my Weekly Downloads columns originally posted on Twin Galaxies International’s website in September of 2010. Note: I added a few interactive elements (like embedded videos, pictures etc.) that could not be implemented by TGI at the time. Sequels, remakes and remakes of sequels abound in this week’s download round up. So without further ado, here are the latest titles hitting the digital shelves for your favorite gaming console. The Official Cover Art for Death Spank. 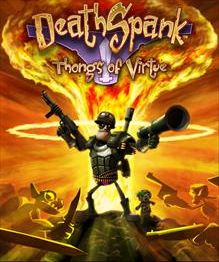 DeathSpank – – Thongs of Virtue (Hothead Games, $14.99 on PSN/1200 Microsoft Points, September 21st): DeathSpank: Thongs of Virtue, the sequel to the recently released downloadable title DeathSpank, starts of with the game’s protagonist DeathSpank searching for six mystical thongs (yes, the bottoms favored by sultry beach goers around the world) that would bring an age of peace never before seen in the universe. But, as is the case with many noble quests, the forces of evil have more dubious plans in mind, which forces DeathSpank to find and destroy the skimpy undergarments before they can fall into the wrong hands. This action RPG also features crazy graphics, hilarious scenarios and two new playable sidekicks in the form of a Wizard named Sparkles and Steve the Kung Fu Master, both playable characters in the game’s new 2-player co-op mode. Serious Sam HD: The Second Encounter (CroTeam, Multiplayer, 1200 Microsoft Points, September 22nd): Serious Sam: The Second Encounter, first introduced on the PC in 2002, gets a re-tooled HD update for those wanting to reek next-gen havoc on X-Box Live. Help Sam fight his arch-nemesis Mental across the globe in the game’s single-player campaign or join up with some friends and take on the numerous multiplayer options available, like the familiar Deathmatch, Capture The Flag and Last Team Standing. Like its re-imagined predecessor, Serious Sam HD: The First Encounter, this release features upgraded graphics for the X-Box 360 console. Also, the arsenal of powerful weapons first introduced in the 2002 original – – namely the sniper rifle, flamethrower and chainsaw – – also receive a re-vamp and accompany an all new Co-Op Tournament mode where up to 4 players can fight in team based or competitive game objectives. Sonic Adventure (Sega, $14.99 on PSN, September 21th): Sonic Adventure, the 1998 Dreamcast favorite featuring Sega’s heroic mascot Sonic the Hedgehog, receives a complete overhaul for current next-gen consoles. Players guide Sonic, Tails, Knuckles, and Amy through a sprawling adventure contained within vivid 3D environments optimized for HDTV displays. Sonic Adventure also includes the Chao Garden, a mini-game area where players can breed, raise and battle the virtual creatures against friends online. Tee off your best drive in Planet Mini-Golf: Stronghold Island. 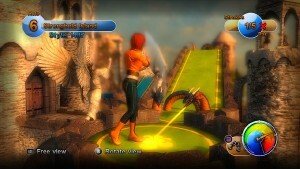 Planet Mini-Golf – Stronghold Island (Zen Studios, $2.99 on PSN, September 21st): The first new DLC for the recently released Planet Mini-Golf downloadable title hits the PSN on September 21st. Stronghold Island adds a new course to the four already found in the soon to be Move compatible release. The original game sports 144 uniquely designed holes within four unique playable areas – – Buccaneer’s Hideout, SoHo, Polar Station and Ancient Valley – – each sporting four 9-hole courses of varying difficulties. Players can compete in a single player campaign or enter numerous online mini-golf tournaments against gamers hailing from around the world. With each victory, players unlock purchasable wardrobe items and putting equipment as rewards for their accomplishments. Blade Kitten (Krome Studios, $14.99 on PSN, September 21st): In this side scrolling action title based on the comic of the same name, players take on the role of Kit Ballard, a female feline bounty hunter searching for a fugitive on the planet Hollow Wish. While on the prowl, Ballard faces off against rival bounty hunters, unfriendly locals and other obstacles that prevent her from finding her target. She receives aid from an alien critter named Skiffy — an ally who helps you by pulling hard to reach switches and finding hidden treasures that can be used to buy new weapons and clothing for Ballard — and a floating A.I. Sword called the Darque Blade. Hack, slash and claw your way through numerous levels until you capture your bounty and collect the purse for the wanted man. 101-in-1 Megamix (Nordcurrent, $14.99 on PSN, September 20th): The name of the game says it all: this title sports 101 mini-games hailing from different gaming genres, like arcade racers, puzzle-based titles and even digital cooking. Similar to Nintendo’s Mario Party, 101-in-1 Megamix takes a different angle, presenting each game as a series of comedy-based TV shows, relying on a variety in visuals and game worlds to make each game distinctive. Race through the Wild West on one “channel” before switching to a space-based cooking show on another. The further you advance through your “TV Guide Mode” (i.e. your main menu), the more games and bonuses you unlock – – you only start with 15 of the 101 games at the get-go. Aero the Acro-Bat 2 (Sunsoft, 800 Wii Points, September 20th): This re-issue of the 1994 SNES classic revives the battle between circus stunt bat Aero and devious ex-clown Edgar Ektor, who wants to shut down the circus that once employed him forever. Help Aero fight through his circus home using his acrobatic repertoire in order to defeat Ektor’s minions before ultimately facing the Bozo wannabe and putting an end to his plans once and for all. Triple Throwing Sports (The Code Monkeys, 500 Wii Points, September 20th): Triple Throwing Sports, a digital Summer Olympics competition trainer of sorts, offers three familiar projectile-based events – – hammer throw, javelin and discus – – that utilizes the Wii Motion controller. With the interactive device, players can alter the strength of a throw, use pinpoint accuracy to aim, and adjust the throwing angle and release point of their athletic effort. Compete against the computer or other players locally. The Very Hungry Caterpillar ABCs (Cybird Co., 800 Wii Points, September 20th): Based on the children’s story of the same name, The Very Hungry Caterpillar allows parents to teach their young ones the basics of English in an interactive setting kids will enjoy. The download utilizes Flash cards and vocabulary quizzes and an hidden image finder game to drill the fundamentals of the language. It also includes a tracking mode that helps parents gauge the progress of their child. Everyday Soccer (Aksys Games, 500 DSi Points, September 20th): Take to the pitch and create your own customizable soccer team in Aksys Games’ latest download for the DSi. Customize the size, shape, uniform (or kit for those living abroad) and skills of each player on your squad. Then, take your team to the field and pit them against other teams available and see how they fare. Rise to the top or take your team back to the drawing board until they are just right. GO Series 10 Second Run (Gamebridge, 200 DSi Points, September 20th): This title’s objective is simple: race your stick-figured man to the finish line with 10 seconds. The features in the game, however, make for a daunting task – – race your stick man through 50 different stages within 3 different game modes in order to prove that even stick-men live a quarter-mile at a time. Nintendo Countdown Calendar (Gamebridge, 200 DSi Points, September 20th): Nintendo’s answer to the iPod’s iCal, Nintendo Countdown Calender lets DSi users keep track of their appointments via an interactive event planner. Add the name of the event, the frequency and time and voila! It also keeps track of all important holidays, special events (like birthdays and anniversaries) and seasonal occurrences.